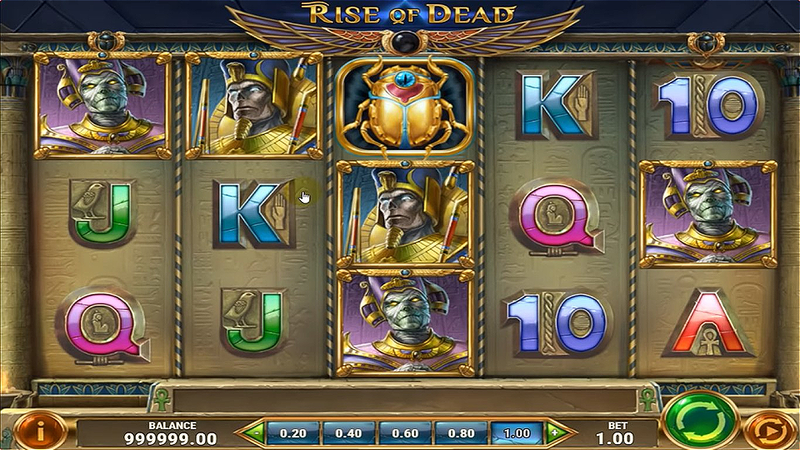 Sequel to the popular Ancient Egypt-themed video slot machine produced by Play’n Go, Rise of Dead takes you to the underworld of the valley of kings where unimaginable treasury is kept hidden for millenniums. The game utilizes the provider’s standard setup with 5 reels, 3 rows, and 20 fixed paylines and comes fully armed with the likes of Wilds and Scatters. Moreover, you will enjoy Mega Stacks, randomly-triggered Gift of Gods Bonus and unique Ancient Free Spins. Find out more in the Rise of Dead slot review. A screenshot is worth a thousand words, right? Here you go! But in the end, you have to try Rise of Dead yourself – one of the recommended casino sites should fit perfectly! In terms of the gameplay, this is a classic game where the main goal is to create a combination of 3 or more matching symbols placed on adjacent reels from the leftmost. The same set of rules stand no matter if you play for fun or for real money. On every spin, the Mega Stacks feature may be triggered to improve your winning odds. Namely, one symbol will be randomly chosen to appear stacked and fill 12 positions on the reels. Another way to get paid in the main course leads through the Rise of Dead Bonus feature. Once activated, the Gift of Gods makes the reels 1, 3 and 5 stacked with the same symbols. On the other side, reels 2 and 4 continue spinning and you can hopefully score a big win of 500x your stake if everything turns right. According to your betting strategy, place bets ranging from €0.20 to €100 and receive a prize according to the paytable. Speaking of which, you will find themed icons representing undead Pharaohs combined with lower-paying cards from Tens to Aces. The same set of icons appear in the Rise of Dead Free Play mode, but this is where you receive demo credits instead of proper cash. Still, we found this mode as a great way for newbies to learn how to win and pay nothing in front. When 1, 2 or 3 Scroll Scatters appear on the reels 1, 3 and 5, lucky winners will initially receive 2, 4 or 10 Rise of Dead Free Spins. More Scatters lead to more Ancient Free Spins throughout which Mega Stacks appear with additional benefits. You will not only have regular symbols stacked but also get some Wilds in stacks. Furthermore, icons with the highest payout rating landed on a winning payline will cover the entire setup, where a screen full of Wilds pays 2500x the stake and Pharaohs pay a maximum of 5000x. 3. What is the RTP factor of Rise of Dead? According to the official info, the default RTP stands at 96.25%, so our Rise of Dead recension sticks to that figure. Unlimited free spins, sizeable static jackpot prize, and a dark and sinister theme make this title stand out from the crowd of games placed in the same scenery. Given the volatility and return to the player, a wise choice would be to implement the Rise of Dead tips and try lowering the house edge.